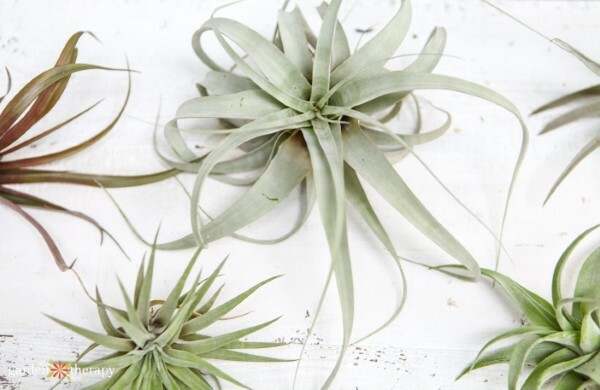 Air plants just about the coolest and most versatile indoor plants you can adopt. The Tillandsia species doesn’t require soil to grow as they absorb water through their leaves. Even more fun, is that they come in a ton of different sizes and shapes, from tiny delicate cones to huge thick tentacles. 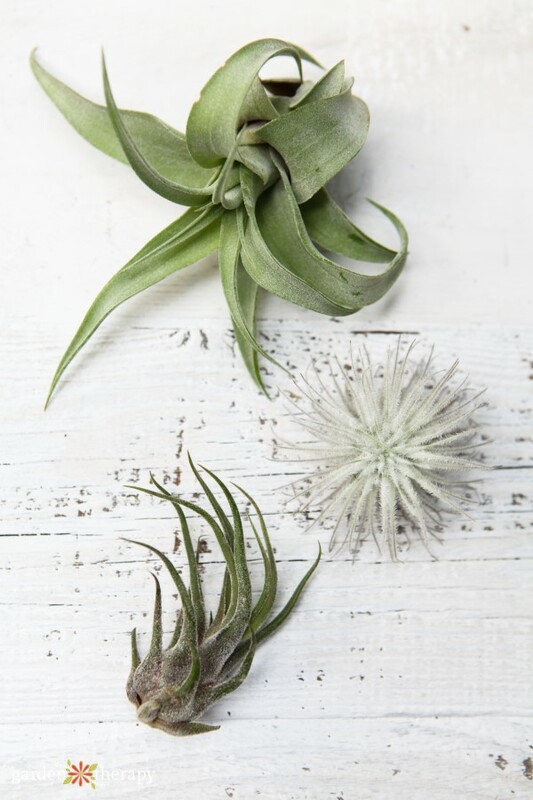 Often when people refer to air plants, they don’t know which variety of Tillandsia they have, despite the fact that different varieties often have different care needs. Even in stores it is common to find a display of Tillandsia in varying size, color, and shape with no labels to differentiate them–they are all simply sold under the banner of “assorted air plants.” There are a great many air plant varieties out there, and this guide will give you an introduction to some common ones as well as some bonus info on each one. 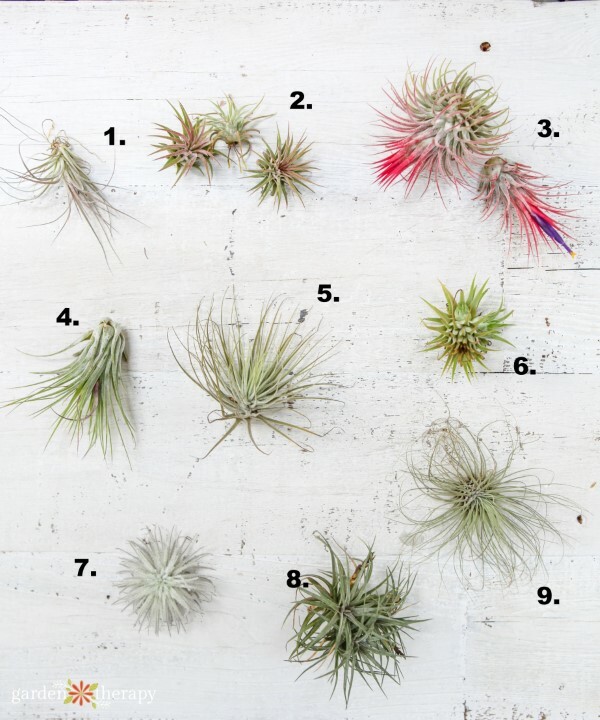 This list will help you choose your next air plant, identify the ones you already have, and learn some special care required for specific varieties. 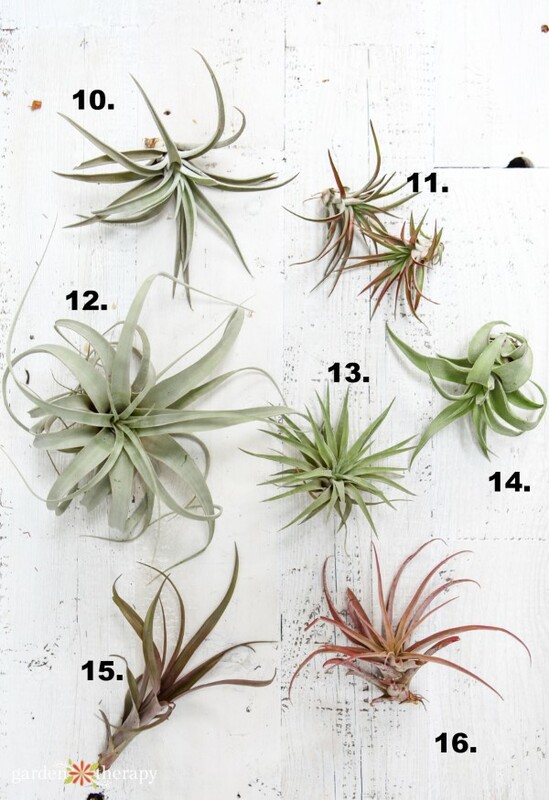 The numbers beside each air plant in the images corresponds to the numbering of the list. 1. T. stricta ‘Black Tip’ is a small-to-medium sized dark green air plant with vertical, pointed leaves that deepen in color at the ends. Special Notes: this is considered one of the easiest air plants to grow, so it’s great for beginners. 2. T. ionantha v. rubra is a small, ball-shaped air plant with bright green leaves that deepen to a crimson color in the center of the plant. It is heavily covered in trichomes, giving it a fuzzy appearance. 3. T. ionantha ‘Conehead’ is large and shaped like a spiky pinecone. The foliage blushes bright red when flowering, and it produces a beautiful purple flower spike. The leaves grow more upright than many other air plants, giving it its characteristic compact cone shape. 4. T. ionantha v. scaposa has straight, upward growing foliage that forms a tight bundle shape. Its leaves are pale green and can look almost white sometimes. When in bloom, the inner leaves turn red and it produces a bright purple flower bract. Special Notes: the leaves are more fragile on this Tillandsia than others, so be gentle when you handle it. T. ionantha v. scaposa likes frequent watering and cool temperatures. 5. T. magnusiana has thin, silver leaves that branch out into a wild mane. Its flower is purple and grows on a red spike sent up form the middle of the plant. Special Notes: this air plant prefers cool temperatures and lots of air circulation. 6. T. ionantha Fuego comes in large and small varieties. It has a rounded, stubby base with spiky upward-reaching silvery green leaves that turn fiery red when in bloom. 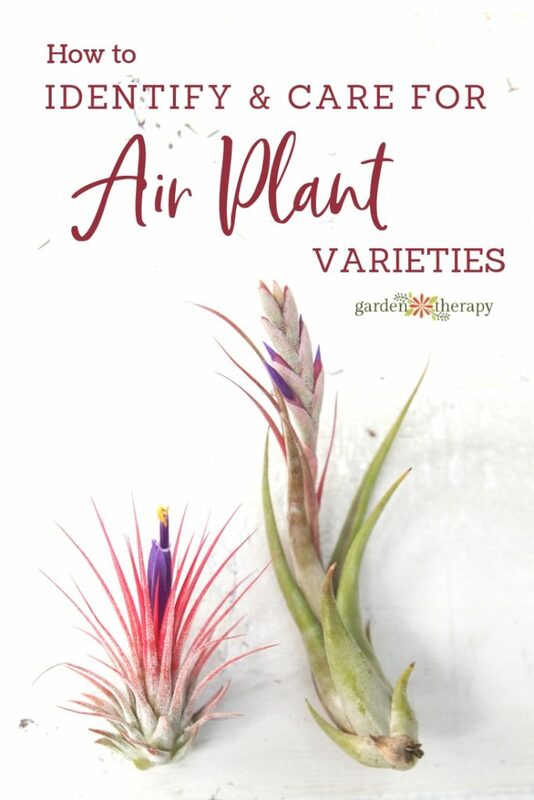 Special Notes: easy to grow and propagate in various different conditions, these are good air plants for beginners to try their hand at. 7. 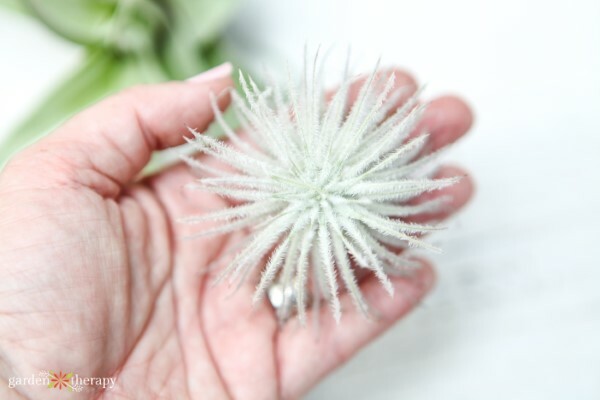 T. tectorum (AKA Snowball) is a fluffy, white air plant with hair on their leaves called trichomes that give it the attractive snowball effect. It comes from Peru where it prefers a drier climate. Snowball won’t do as well in a hot, humid climate so this is a perfect indoor air plant. T. tectorum is rare, and therefore quite a bit more expensive than some other varieties. Special Notes: give T. tectorum lots of air circulation and let it dry well between watering. Only bathe this air plant and save the misting for humidity-loving varieties. 8. T. stricta ‘Stiff Purple’ has sprawling, spidery, green leaves with a purplish hue and makes thick, cylinder shaped pastel pink flowers. Special Notes: T. stricta does best in a humid environment with good air circulation. If you live in a warm climate, you can even keep them outside. 9. T. argentea are very small with a mass of thin, wispy, hair-like foliage. The flower is bright red and protrudes straight out of the middle of the plant. Special Notes: T. argentea’s tiny size makes it perfect for keeping inside terrariums or other small containers. 10. T. harrisii has pale glaucous leaves that are thin, sharp, and curl downward. They grow to about three to five inches tall and three inches wide. Blooms are red and purple. Special Notes: in their native Guatemala, these plants grow in bright, full sunlight on rocks, so keep them somewhere bright in your home. 11. T. brachycaulos v. abdita is medium sized with very soft green leaves that turn a bright red when it begins to flower. T. brachycaulos v. abdita produces colorful flowers in purple, yellow, and pink. 12. T. xerographica (AKA the King of Tillandsias) is a very large (up to three feet in diameter!) rosette-shaped air plant with silvery-blue leaves. T. xerographica is native to dry forests of Mexico, El Salvador, and Guatemala. 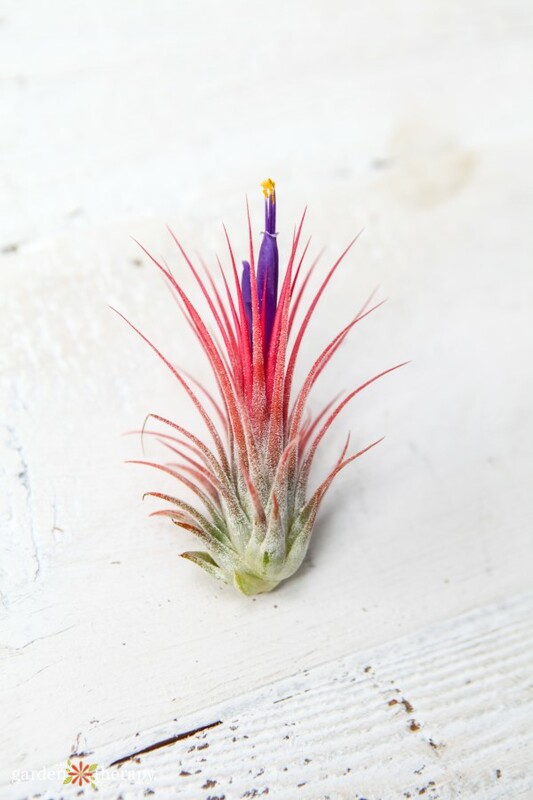 Special Notes: When this air plant flowers, it produces a huge red and bright green flower spike that will last for months. 13. T. plagiotrophica has glaucous green foliage that grows in a stunning starburst shape and gets to be four to six inches tall. When in bloom, it produces a pure white flower in the center of its foliage. Special Notes: Native to San Salvador and Guatemala, T. plagiotrophica likes cooler temperatures and good air circulation. Place it in a well-ventilated area for best results. 14. T. streptophylla (AKA Shirley Temple) has pale green foliage with a slight purple tinge. Its broad leaves curl downward and sometimes turn into ringlets, hence its common name of “Shirley Temple.” Special Notes: Shirley Temple air plants prefer dry environments, so water them less frequently than other Tillandsia and skip misting them, as they don’t like to be too humid. Instead, give them an occasional bath. 15. T. flabellata rubra is a large air plant that has wide green leaves with ruby-red tips and bright crimson flower spikes. It usually grows to be about six to nine inches long, but can get up to eighteen inches in length. Special Notes: can be grown in soil in a pot or without soil like other air plants. 16. T. capitata ‘Peach’ is a medium-sized air plant with silvery foliage that changes to a peach color when it blooms. They have a symmetrical conical rosette shape. Special Notes: T. capitata ‘Peach’ is native to humid parts of South and Central America, so they like to be misted as well as bathed. 17. T. baileyi (AKA Bailey’s Ball Moss) is native to Mexico and the southern United States, where it grows in trees. These air plants are long (six to eight inches) and thin with tentacle-like rounded bright green leaves reaching upward and outward. When in bloom, the foliage turns a deep shade of purple. Special Notes: this Tillandsia sends out pups easily, so if you want an air plant that will reproduce, this one is a good choice. 18. T. circinata is medium sized (six to eight inches tall with a one-inch base) with silver-green leaves that eventually curl all the way around into circles. Their blooms are vibrant yellow or purple. Special Notes: T. circinata are very durable, easy-to-care for plants and do well in areas with low light. 19. T. pruinosa (AKA Fuzzywuzzy) is a very small air plant that has trichomes all over it, giving it its characteristic “fuzzy” appearance. The cylindrical leaves twist in different directions but generally grow upwards and are dark green with a silvery tinge. Produces purple flowers on a bright pink stem. Special Notes: prefers cooler temperatures and areas with fresh, moving air. 20. T. butzii has a rounded, speckled base with thin, curly foliage that shoots upward and is green to yellowish in color. It reaches five to seven inches tall and up to four inches wide. Special Notes: This air plant likes cool, humid climates and frequent waterings, so bathe and mist it regularly. What kind of Tillandsia do you have? Let us know in the comments! This is great! I always wonder what types of air plants I see and have definitely owned some that I couldn’t identify! Thanks for putting this together! 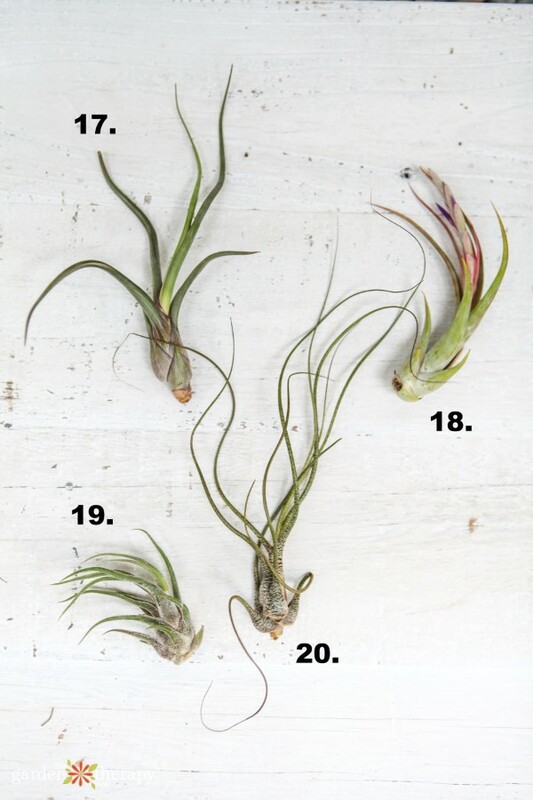 hi this is a great little guide but i didnt see the Tillandsia i have. i think it may be a Tillandsia Juncea. it is small and has long grass like pale green leaves.